Thoracic outlet syndrome (TOS) is a controversial topic in the literature; many proponents support the existence of the condition, but some strongly vocal opponents doubt the validity of TOS as a medical entity. Even the name itself has been questioned because the actual site of pathology is technically the thoracic "inlet," not the "outlet." The primary controversy seems to center around the lack of objective criteria for diagnosis and the confusion with multiple types or clinical presentations. Since TOS involves proximal neurovascular structures (see the image below), symptoms often are confused with various distal compression neuropathies or cervical radiculopathies. Progressive postural decompensation with neurovascular compression. A: Normal resting posture. B: Shoulder protraction beginning; the sternomastoid muscles are shortening, drawing the head anteriorly and inferiorly. C: Advanced deformity with adaptive shortening of scalene and pectoralis minor muscles. Also note narrowed costoclavicular space (ribs 1-5 have been relatively elevated). Neurovascular compression is evident at all 3 sites. In addition, surgical treatment has been known to have devastating complications, which further fuels debate with the opponents of recognition of this entity. Conservative treatment appears to be the most universally accepted approach, with even surgeons recommending a prolonged trial before any operative procedure. True neurogenic TOS - The brachial plexus is injured in these cases as documented by electromyography (EMG) and/or nerve conduction studies. Nonspecific or disputed TOS - Patients have symptoms, but there are no abnormal tests to document the lesion clearly. This category is by far the most common type of TOS seen in the clinical setting. Many authors have discovered accessory cervical ribs associated with TOS  ; however, they have noted tough fibrous bands coming off the accessory ribs that are believed to be more responsible for the pathology. There have even been reports of bony fusion of variant cervical ribs, resulting in bifid ribs with attached fibrous bands. The bands cause tethering of the brachial plexus, which results in traction and, therefore, symptoms. Other authors report compression or irritation of the neurovascular bundle more distally under the pectoralis minor muscle or from anterior displacement of the humeral head. Additionally, clavicle fractures can result in plexopathy from expanding hematomas or pseudoaneurysms that compress the plexus, with variable latent periods following the fracture. Delayed onset of symptoms may suggest exuberant callus from the healing fracture site. Nonunion of the fracture site also can result in direct compression by the lateral fragment, which is pulled inferiorly. The inability to make a definitive and accurate diagnosis makes determination of the exact prevalence of this condition impossible. The prevalence of nonspecific thoracic outlet syndrome (TOS) has been reported as high as 23% of soft-tissue injuries of the cervical spine. TOS is overlooked or misdiagnosed commonly, especially upon presentation to the emergency department. The true or classical neurogenic or vascular TOS incidence is considered rare, with only 1 case per million population estimated for the neurogenic type. Some believe that TOS is the most common cause of acute arterial occlusion in the upper limbs of adults younger than 40 years. It is more common with occupations or activities that involve prolonged posturing of the neck, such as secretaries, cashiers, machine operators, surgeons, truck drivers, and overhead work or lifting. There is no increased incidence in athletes. No known mortality is associated directly with thoracic outlet syndrome (TOS). Morbidity often encompasses debilitating functional loss of the involved upper extremity, loss of livelihood or occupation, especially if the work involves overhead activity (eg, hairdressing, carpentry, painting). True neurogenic TOS causes neurologic deficit. Depending on the amount of nerve injury, there usually is weakness of the hand and sensory deficits in the lower trunk distribution. Devastating complications, usually to the brachial plexus, have been reported from surgical treatment for TOS. Age of onset of thoracic outlet syndrome is from the second to the eighth decade, with a peak occurring in the fourth decade. In the younger age group, there appears to be a greater likelihood of anatomic or structural abnormality, such as cervical rib variants and fibrous bands. Lee J, Laker S, Fredericson MI. Thoracic outlet syndrome. Physical Medicine & Rehabilitation. 2010. 2:64-70. Sucher BM. Thoracic outlet syndrome-postural type: ultrasound imaging of pectoralis minor and brachial plexus abnormalities. PM R. 2012 Jan. 4(1):65-72. [Medline]. de Leon RA, Chang DC, Hassoun HT, et al. Multiple treatment algorithms for successful outcomes in venous thoracic outlet syndrome. Surgery. 2009 May. 145(5):500-7. [Medline]. Davidovic LB, Koncar IB, Pejkic SD, et al. Arterial complications of thoracic outlet syndrome. Am Surg. 2009 Mar. 75(3):235-9. [Medline]. Ferrante MA, Ferrante ND. The thoracic outlet syndromes: Part 1. Overview of the thoracic outlet syndromes and review of true neurogenic thoracic outlet syndrome. Muscle Nerve. 2017 Jun. 55 (6):782-93. [Medline]. Ferrante MA, Ferrante ND. The thoracic outlet syndromes: Part 2. The arterial, venous, neurovascular, and disputed thoracic outlet syndromes. Muscle Nerve. 2017 Oct. 56 (4):663-73. [Medline]. Ferrante MA. The thoracic outlet syndromes. Muscle Nerve. 2012 Jun. 45(6):780-95. [Medline]. Brewin J, Hill M, Ellis H. The prevalence of cervical ribs in a London population. Clin Anat. 2009 Apr. 22(3):331-6. [Medline]. Cagli K, Ozcakar L, Beyazit M, et al. Thoracic outlet syndrome in an adolescent with bilateral bifid ribs. Clin Anat. 2006 Sep. 19(6):558-60. [Medline]. Illig KA, Donahue D, Duncan A, et al. Reporting standards of the Society for Vascular Surgery for thoracic outlet syndrome. J Vasc Surg. 2016 Sep. 64 (3):e23-35. [Medline]. Levin LS, Dellon AL. Pathology of the shoulder as it relates to the differential diagnosis of thoracic outlet compression. J Reconstr Microsurg. 1992 Jul. 8(4):313-7. [Medline]. Demirbag D, Unlu E, Ozdemir F, et al. The relationship between magnetic resonance imaging findings and postural maneuver and physical examination tests in patients with thoracic outlet syndrome: results of a double-blind, controlled study. Arch Phys Med Rehabil. 2007 Jul. 88(7):844-51. [Medline]. Jordan SE, Machleder HI. Diagnosis of thoracic outlet syndrome using electrophysiologically guided anterior scalene blocks. Ann Vasc Surg. 1998 May. 12(3):260-4. [Medline]. Torriani M, Gupta R, Donahue DM. Sonographically guided anesthetic injection of anterior scalene muscle for investigation of neurogenic thoracic outlet syndrome. Skeletal Radiol. 2009 May 14. [Medline]. Likes K, Rochlin DH, Salditch Q, et al. Diagnostic accuracy of physician and self-referred patients for thoracic outlet syndrome is excellent. Ann Vasc Surg. 2014 Jul. 28(5):1100-5. [Medline]. Chandra V, Little C, Lee JT. Thoracic outlet syndrome in high-performance athletes. J Vasc Surg. 2014 Oct. 60(4):1012-7; discussion 1017-8. [Medline]. Abe M, Ichinohe K, Nishida J. Diagnosis, treatment, and complications of thoracic outlet syndrome. J Orthop Sci. 1999. 4(1):66-9. [Medline]. Aligne C, Barral X. Rehabilitation of patients with thoracic outlet syndrome. Ann Vasc Surg. 1992 Jul. 6(4):381-9. [Medline]. Atasoy E. Thoracic outlet compression syndrome. Orthop Clin North Am. 1996 Apr. 27(2):265-303. [Medline]. Cherington M, Happer I, Machanic B, Parry L. Surgery for thoracic outlet syndrome may be hazardous to your health. Muscle Nerve. 1986 Sep. 9(7):632-4. [Medline]. Colon E, Westdorp R. Vascular compression in the thoracic outlet. Age dependent normative values in noninvasive testing. J Cardiovasc Surg (Torino). 1988 Mar-Apr. 29(2):166-71. [Medline]. Connolly JF, Ganjianpour M. Thoracic outlet syndrome treated by double osteotomy of a clavicular malunion: a case report. J Bone Joint Surg Am. 2002 Mar. 84-A(3):437-40. [Medline]. DeLisa JA, Gans BM, Walsch NE. Physical Medicine and Rehabilitation Principles and Practice, 4th Ed. Philadelphia, Lippincott Williams & Wilkins. 2005. Dobrusin R. An osteopathic approach to conservative management of thoracic outlet syndromes. J Am Osteopath Assoc. 1989 Aug. 89(8):1046-50, 1053-7. [Medline]. England JD, Tiel RL. AAEM case report 33: costoclavicular mass syndrome. American Association of Electrodiagnostic Medicine. Muscle Nerve. 1999 Mar. 22(3):412-8. [Medline]. Felice KJ, Butler KB, Druckemiller WH. Cervical root stimulation in a case of classic neurogenic thoracic outlet syndrome. Muscle Nerve. 1999 Sep. 22(9):1287-92. [Medline]. Ferrante MA. Brachial plexopathies: classification, causes, and consequences. Muscle Nerve. 2004 Nov. 30(5):547-68. [Medline]. Lee RK, Pollak EW. Radiological diagnosis. 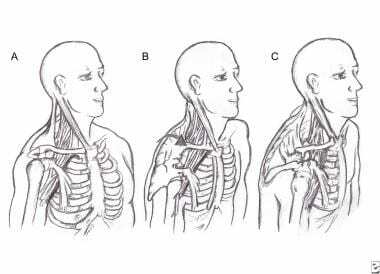 In: Thoracic Outlet Syndrome: Diagnosis and Treatment. Mount Kisco, NY:. Futura Publishing Co. 1986:107-124. Leffert RD. Thoracic outlet syndromes. Hand Clin. 1992 May. 8(2):285-97. [Medline]. Lindgren KA, Leino E. Subluxation of the first rib: a possible thoracic outlet syndrome mechanism. Arch Phys Med Rehabil. 1988 Sep. 69(9):692-5. [Medline]. Lindgren KA, Leino E, Manninen H. Cineradiography of the hypomobile first rib. Arch Phys Med Rehabil. 1989 May. 70(5):408-9. [Medline]. Machleder HI. Thoracic outlet syndromes: new concepts from a century of discovery. Cardiovasc Surg. 1994 Apr. 2(2):137-45. [Medline]. Mackinnon SE, Novak CB. Evaluation of the patient with thoracic outlet syndrome. Semin Thorac Cardiovasc Surg. 1996 Apr. 8(2):190-200. [Medline]. Mackinnon SE, Patterson GA, Novak CB. Thoracic outlet syndrome: a current overview. Semin Thorac Cardiovasc Surg. 1996 Apr. 8(2):176-82. [Medline]. Nishida T, Price SJ, Minieka MM. Medial antebrachial cutaneous nerve conduction in true neurogenic thoracic outlet syndrome. Electromyogr Clin Neurophysiol. 1993 Jul-Aug. 33(5):285-8. [Medline]. Oh SJ. Clinical Electromyography: Nerve Conduction Studies (3rd Ed). Philadelphia, Lippincott Williams & Wilkins. 2003. Palmer JB, Uematsu S, Jankel WR, Arnold WP. A cellist with arm pain: thermal asymmetry in scalenus anticus syndrome. Arch Phys Med Rehabil. 1991 Mar. 72(3):237-42. [Medline]. Panegyres PK, Moore N, Gibson R, et al. Thoracic outlet syndromes and magnetic resonance imaging. Brain. 1993 Aug. 116 ( Pt 4):823-41. [Medline]. Pang D, Wessel HB. Thoracic outlet syndrome. Neurosurgery. 1988 Jan. 22(1 Pt 1):105-21. [Medline]. Press JM, Young JL. Vague upper-extremity symptoms? Consider thoracic outlet syndrome. The Physician and Sportsmedicine. 1994. 22(7):57-64. Preston DC, Shapiro BE. Electromyography and Neuromuscular Disorders: Clinical-Electrophysiologic Correlations, 2nd Ed. Philadelphia, Elsevier Butterworth Heinemann. 2005. Rayan GM. Thoracic outlet syndrome. J Shoulder Elbow Surg. 1998 Jul-Aug. 7(4):440-51. [Medline]. Redenbach DM, Nelems B. A comparative study of structures comprising the thoracic outlet in 250 human cadavers and 72 surgical cases of thoracic outlet syndrome. Eur J Cardiothorac Surg. 1998 Apr. 13(4):353-60. [Medline]. Richardson AB. Thoracic outlet syndrome in aquatic athletes. Clin Sports Med. 1999 Apr. 18(2):361-78. [Medline]. Sucher BM. Palpatory diagnosis and manipulative management of carpal tunnel syndrome: Part 2. 'Double crush' and thoracic outlet syndrome. J Am Osteopath Assoc. 1995 Aug. 95(8):471-9. [Medline]. Sucher BM. Thoracic outlet syndrome--a myofascial variant: Part 1. Pathology and diagnosis. J Am Osteopath Assoc. 1990 Aug. 90(8):686-96, 703-4. [Medline]. Sucher BM. Thoracic outlet syndrome--a myofascial variant: Part 2. Treatment. J Am Osteopath Assoc. 1990 Sep. 90(9):810-2, 817-23. [Medline]. Sucher BM, Glassman JH. Upper extremity syndromes. In: Mein E, Stanton D, ed. Manipulation. Philadelphia:. WB Saunders Co. 1996:787-810. Sucher BM, Heath DM. Thoracic outlet syndrome--a myofascial variant: Part 3. Structural and postural considerations. J Am Osteopath Assoc. 1993 Mar. 93(3):334, 340-5. [Medline]. Tilki HE, Stalberg E, Incesu L, et al. Bilateral neurogenic thoracic outlet syndrome. Muscle Nerve. 2004 Jan. 29(1):147-50. [Medline]. Vender MI, Truppa KL, Ruder JR, et al. Upper extremity compressive neuropathies. In: Derebery VJ, Kasdan ML, ed. Injuries and Rehabilitation of the Upper Extremity. 1998:243-262. Wilbourn AJ. Thoracic outlet syndrome surgery causing severe brachial plexopathy. Muscle Nerve. 1988 Jan. 11(1):66-74. [Medline]. Wood VE, Biondi J. Double-crush nerve compression in thoracic-outlet syndrome. J Bone Joint Surg Am. 1990 Jan. 72(1):85-7. [Medline]. Woods WW. Thoracic outlet syndrome after trauma, diagnosis is elusive. Modern Medicine. 1978. 46:147. Scalene focal (left) and regional (right) stress tests for thoracic outlet syndrome. Both tests can be easily combined to enhance the stress effect (may be helpful in mild cases). Pectoral focal (left) and regional (right) stress tests for thoracic outlet syndrome. Algorithm for the treatment of nonprogressive thoracic outlet syndrome (TOS). Anti-inflammatory medication, muscle relaxants, and activity modifications all are used as indicated and tolerated in all cases. Values for very severe TOS are greater than those for severe TOS, and the patient probably should be referred for surgical evaluation.